Good day, everyone! I’m sure a good number of you are having a warm drink to help combat the arctic temperatures that have rolled in! 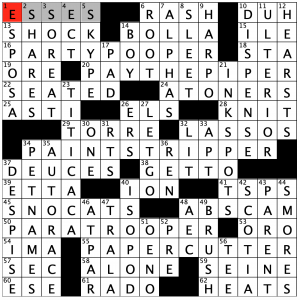 Today’s milestone crossword, Liz’s 400th in the Crossword Nation series, features a fun word progression in which the second word of the first theme entry ends up as the first word of the successive theme entry. That sequence continues throughout the theme entries going down the grid, and it is topped off by having the second word of the final theme entry being the same as the first word of the first theme entry that kicked off the whole sequence. I’m sure I could have explained that concept much more succinctly. Oh, well! HARD NEWS (45A: [Serious, timely journalism]) – You find so much more of this in independent media and/or in the form of long-form written stories that appear in newspapers or online than in cable news. What can I say? I’m a media critic who works in broadcast journalism. “Sports will make you smarter” moment of the day: ANDREA (8D: [“The Prayer” tenor Bocelli ]) – How did the English soccer team Leicester City Football Club, famous for overcoming 5000-to-1 championship odds at the beginning of the 2015-16 seasons to become champions of the English Premier League, kick off celebrations of that fairytale season? Bring in Andrea Bocelli to sing “Nessun Dorma” to its raucous, mostly liquored-up fans of course!! The manager of the soccer team that season, fellow Italian Claudio Ranieri, is a personal friend of Bocelli, and the singer was invited by Ranieri and the team to perform at the team’s home stadium immediately after the final game of that season. Watching this will either make you giggle as a music lover and/or sports fan, or make you puke as a music purist in hearing the fans in the stands continue to talk/cheer/celebrate during Bocelli’s performance. Either way, enjoy! Thank you so much for the time, everyone! Again, stay warm! Have a wonderful day and, as always, keep solving!! This puzzle was berry good! 9D: DUCK DUCK GOOSE [Children’s tag game] – I didn’t realize how vicious this game could get until I played it with a group of preteens. 17D: PLINY THE ELDER [“Naturalis Historia” writer killed during the eruption of Vesuvius] – I did not know this! Interesting fact of the day. 18D: THE SHORT STRAW [Picking it makes you a loser] – But a winner in my heart! I liked this! The last word of each theme entry can have BERRY added to it, and the result is a delicious fruit cocktail: ELDER/BERRY, BLUE/BERRY, STRAW/BERRY, and GOOSE/BERRY. I liked the variety of berries and appreciated how natural/in-the-language each of the themers was. I also enjoyed the little Easter eggs of fruit-related fill throughout the rest of the puzzle, including COMPOTES and the [Fruit source] TREE. I was kind of sad not to see an entry like CRUNCH/BERRY, but I can see many solvers not enjoying that as much as I would. : ) The themers being downs to simulate hanging berries was also a great touch. I really enjoyed SASHAY, TINA Fey, THRILL and SPEED in the same row (followed by NEED! ), the clue for BAR [Tender spot? ], and DOPE. Also loved the shout outs to ETTA James and the Jackson Five! The top half of the grid, in general, was much cleaner and stronger than the bottom half, which included ECLAT ADDL APOEM IRAE KOP IMY all in the bottom third of the puzzle. No ODETO that, I reckon. All in all, a fun puzzle! 17a. [Empty talk not backed by action], SERVICE. 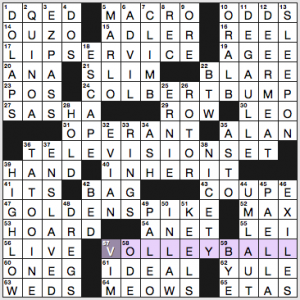 I guess we’re supposed to read the ends of the other themers as volleyball nouns rather than verbs, since you cannot SERVICE the ball (unless, say, you’re mending it or inflating it). 24a. [Boost after appearing on a certain old Comedy Central show], COLBERT BUMP. 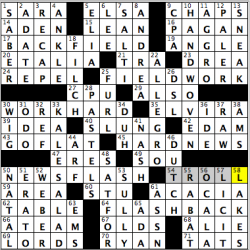 One wonders if this puzzle was constructed way back before Colbert moved to CBS. 36a. [Product from RCA or LG], TELEVISION SET. Would have preferred not to have the echo of “telecast” in the 56a LIVE clue. 47a. [Symbol of the completion of the Transcontinental Railroad], GOLDEN SPIKE. Fair enough. Pretty sure I’ve seen other BUMP/SET/SPIKE themes over the years. 14a. [Liqueur with a licoricelike flavor], OUZO. Gross. I hate licoricelike flavors. You may have as much of that as you want, but keep it away from my face! 31a. [In effect], OPERANT. Weird clue. I feel like I really only see OPERANT when it’s used to modify “conditioning.” More often when you want to say something is in effect, you’d say it’s operative, or operating. 5d. [Kingpin on “The Wire”], MARLO. Marlo Thomas, call your publicist. This should’ve been you. 33d. [Men’s gymnastics event], RINGS. Doing the Iron Cross is all fun and games until your biceps come unmoored and roll up inside your arm. 36d. [Luke Skywalker’s home planet], TATOOINE. I rarely remember if it’s got a double T or double O. 46d. [Banishees], EXILES. I’m not convinced that anyone actually tacks on -ee to banish, but it’s a little neat that it looks like banshee. A simple enough theme this week that begs an even simply question: Why the initials MG? I’ll bet there is a story behind the inspiration here. Or, as is sometimes the case, I could be missing something extremely obvious! 33A [They’re unnamed until the end, on some game shows] MYSTERY GUESTS – Like on the The Masked Singer, among other shows. Again, if there is a story behind the choice of M.G., I would love to hear it. But maybe it is benign; a theme doesn’t always have to blow your socks off. And this is a Jonesin’ with lots of fun stuff in it, as usual, including some obscurities. A solid 4.4 stars this week. 37A [Reddit Q&A feature] AMA – This is for Ask Me Anything. I am new to Reddit, so I have never watched one of these. I’ll figure it out. Maybe. 39A [“Fight Club” chemical] LYE – I barely remember how this figured into the plot. This is actually a movie I have seen! Albeit 20 years ago! 48A [Aptly titled 1999 debut album (and genre) for Eiffel 65] EUROPOP – Most music is global these days, but there are acts that don’t have much success here in the US. There is also K-Pop, that music being from Korea. 7D [Air beyond the clouds] ETHER – Is this describing the thin air way up there? That you can’t breathe? 9D [NYC’s __ Hammarskjöld Plaza] DAG – The former UN leader who is the namesake of this plaza is definitely crossword famous! 25D [Gina of “Cocktail” and “Showgirls”] GERSHON – She is still appearing in stuff, like Red Oaks on Amazon Prime. She has been around for nearly 40 years, according to imdb.com. 31D [“Electra Woman and __ Girl” (’70s series)] DYNA – What? Never heard of it. This show starred Deidre Hall of Days of our Lives fame. It also looks like there was some sort of reboot a couple of years ago. 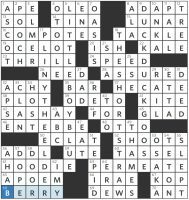 49D [Full of fruit, like some doughnuts] JAMMY – Lots of doughnut talk in this puzzle! And this sounds like a word a 5 year old would use. Surprisingly, at least to me, it IS a real word! 59D [Actress Meyer] DINA – I knew her name sounded familiar. 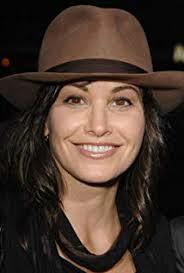 She was in Starship Troopers, that movie that comes on seemingly daily on some channel or another. 60D [“Toy Story” boy] ANDY – This is almost TOO easy, isn’t it? I don’t believe I know who Frank Virzi is (not a pseudonym, I hope! ), but that did not affect this Tuesday solve. In light of the recent WSJ announcement saying they would no longer use pseudonyms, perhaps I will assume there will be less use of them going forward? The pattern here is nothing if not uniform; sometimes in a puzzle like this you might see something with the patter PAP@ER instead, but that doesn’t appear to be as easy to use anyway. I couldn’t find anything usable (PAPA BURGER??) that didn’t use the word paper. Nice and clean. Doesn’t seem to “Tuez” at all! A solid 4.3 stars today. 14A [Valpolicella wine brand] BOLLA – I am not a wine drinker, so this is totally foreign to me. 45A [Polar expedition vehicles] SNO-CATS – This is a brand name, I believe, despite it always being in crosswords. These things are big! 61A [Swiss watch brand] RADO – I don’t like to wear watches much, but I am changing my tune since I don’t deliver packages anymore. I usually wear my running watch now for step counts, heart rate, and sleep tracking. I certainly wouldn’t wear something ridiculously expensive. Speaking of expensive watches, check out Rafa Nadal’s watch! 1D [Señor’s wife] ESPOSA – Unlike some narrow-minded people in this country, I WISH I knew how to speak Spanish better. Perhaps I will still take it up one day. 5D [Video conferencing choice] SKYPE – I never use this. I feel like I should. Perhaps I don’t Skype my parents enough! 21D [Classic ’30s-’50s vocal quartet, with “the”] INK SPOTS – This is going way back. Before my time, but I have heard of this group. 44D [Gooey campfire treats] S’MORES – I don’t care for these. Maybe because I don’t care for camping in general! Have a great week. If you’re in the midwest like I am, STAY INDOORS! This entry was posted in Daily Puzzles and tagged Benjamin Kramer, Elizabeth C. Gorski, Frank Virzi, Matt Jones, Winston Emmons. Bookmark the permalink. I misread “Banishees” as “Banishes.” EXILES was still the right answer. For the NYT 24a, the Colbert bump was a phrase specifically used on the Colbert Report describing a polling boost for politicians that came on his show. So while that doesn’t necessarily mean this wasn’t made before his move, it’s also likely that they clued it referencing his old show because that’s when the phrase was mainly used. Right, and it was definitely a tongue-in-cheek boast from Colbert, like so much else on the show. Does anyone know when/whether the LAT .puz files on Cruciverb will be back? I appreciate them when they show up, and certainly miss them when they’re gone. Maybe the constructor once owned the now defunct MG sports car. I did and loved it. I love the old MGs, too (especially the MGA). But they have got to be one of the most mechanically fickle cars ever built. If you own one, you become an MG mechanic by default. Ah. to be young again. I think I still have that thingie for synching the Weber carbs on the 67 lying around somewhere. 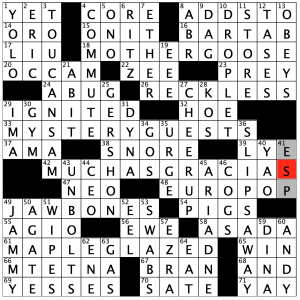 Thought there was a NYT moratorium on “what the starts of” or “what the ends of” puzzles, but there’s two in a row. NYT: “OUZO” – A generous splash of that, or Sambucca, while cooking salmon, can be divine! Do you put it on the salmon? I just assumed that Matt’s MG puzzle was a shout out to Matt Gaffney. You may be onto something, Kelly. I liked the intersection of Bert in Colbert Bump and Ernie in the NYT.